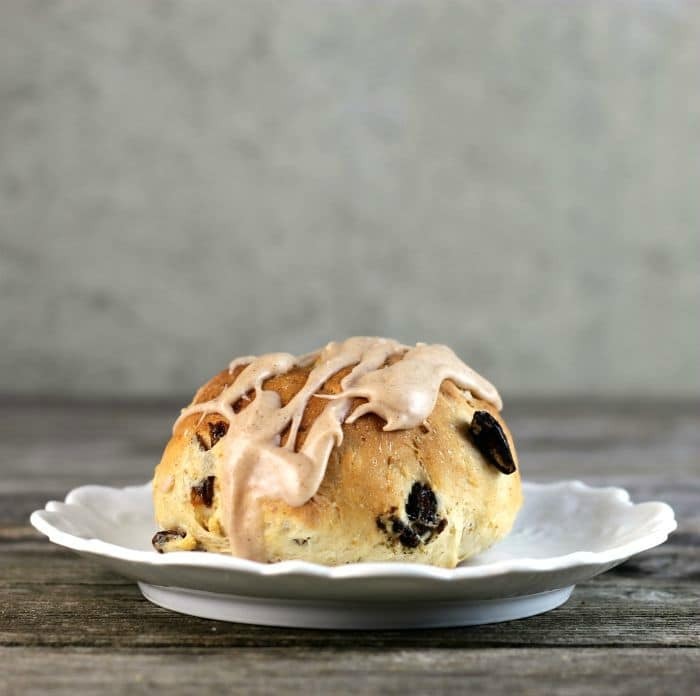 Cinnamon raisin oatmeal buns are loaded with cinnamon and raisins and topped with a cinnamon icing. I love eating them for breakfast or for a snack during the day, oh what the heck they are perfect for any time of the day. I mentioned in one of my last posts that my father-in-law was here for a visit. You know that he ate cinnamon raisin bread for lunch almost every day that he was here. Yeah, he made a sandwich with the bread using hard salami or summer sausage. Mike and the kids thought the combination was a little weird. But, not me. I think it maybe a little unique but I am sure that it was quite tasty. This got my wheel turning. I love making bread from scratch. Really, take a look around on my blog you will see all kinds of bread recipes. In my book, there aren’t too many things that are tastier than homemade bread. So as I said that the wheels started turning. Instead of making one or two loaves of bread, I decided to go with buns. They are easier to freeze and yes these buns can be frozen. You can take them out of the freezer and microwave them for 20 seconds or so. The oatmeal makes the buns hearty. They would be perfect for a sandwich or cut them in half and toast them under the broiler and top them off with butter. There are so many options. The raisins and cinnamon are added to the bread at the beginning of the process of making the bread, this makes is simple to mix in. 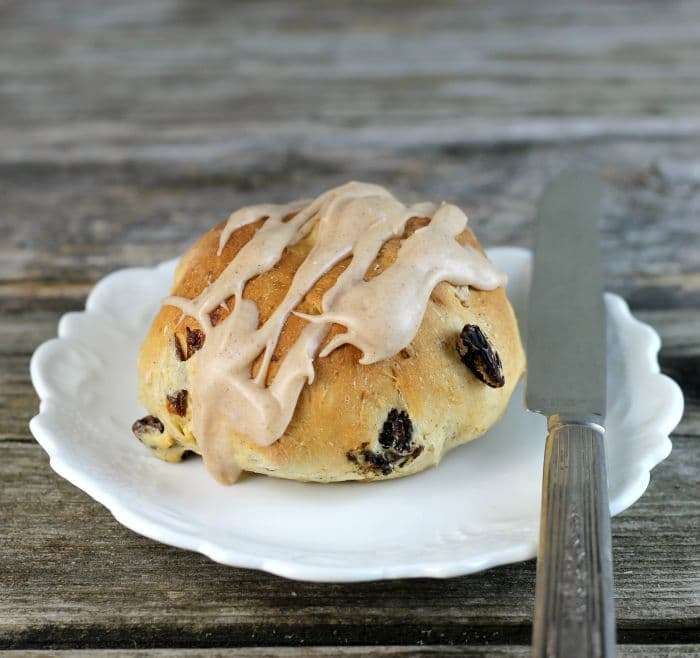 I added a cinnamon powdered sugar icing to my cinnamon raisin oatmeal buns, but if you prefer to omit this step it is fine. In a large mixing bowl combine 1 cup flour, old fashion oats, yeast, salt, brown sugar, 1 1/2 teaspoon cinnamon. Heat the milk, water, and butter to 120 to 130 degrees F. Add to the dry ingredients and mix in. Add the eggs and with a wooden spoon mix until well blended. mix in the raisins. Gradually add the remaining flour, mixing by hand. You will want the dough slightly sticky. In the bowl knead the dough until it is smooth. Grease the bottom of the bowl and turn the bread over to grease both sides. Place the buns onto a greased baking pan about 2 inches apart. Let rest for 1/2 hours. Preheat the oven to 375 while the buns are resting. Once the buns are ready place them in the preheated oven and bake 10 to 12 minutes or until they are golden brown. To make the icing place the powdered sugar and cinnamon in a medium bowl gradually add enough cream (milk or water) to make the right consistency for drizzling. 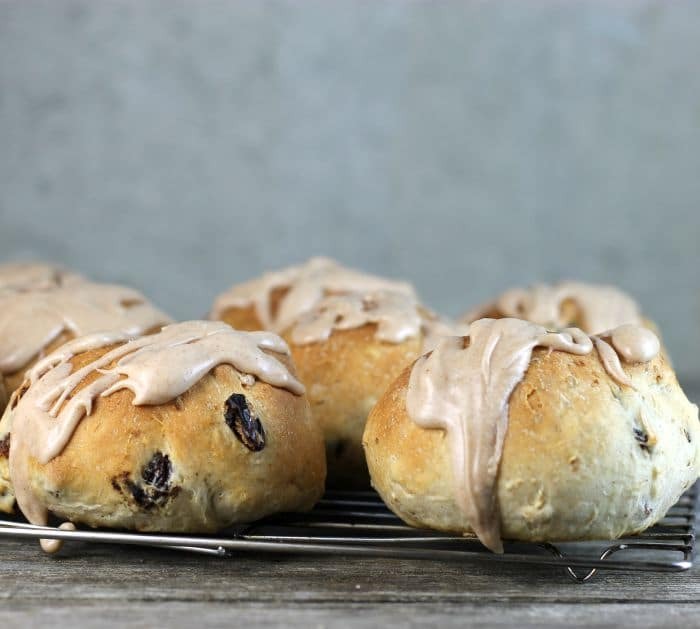 They look particularly tempting with that cinnamon glaze! I think your father-in-law is right on the money with that sandwich–I love the salty-sweet-savory thing :). These buns sound absolutely amazing, Dawn! I adore cinnamon raising bread! Hope you’re having a great weekend! I’d make a sandwich with one of these, too (well, maybe before they’re frosted!). 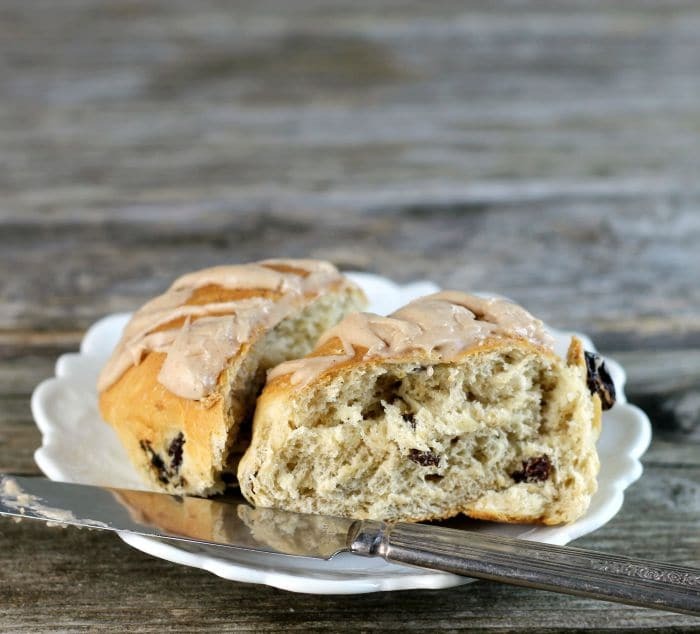 My FIL loved when I bought cranberry raisin bread and we’d both eat it for breakfast and lunch. I know he would have loved these, too.